Chicago has a solid stock of Frank Lloyd Wright designed houses, but even still, the rare Prairie style homes don’t hit the market everyday. This freshly listed Douglas row house may be one of the most rare Frank Lloyd Wright homes out there. A part of the Roloson Houses built in 1894, these homes represents the only row houses ever designed by Frank Lloyd Wright. 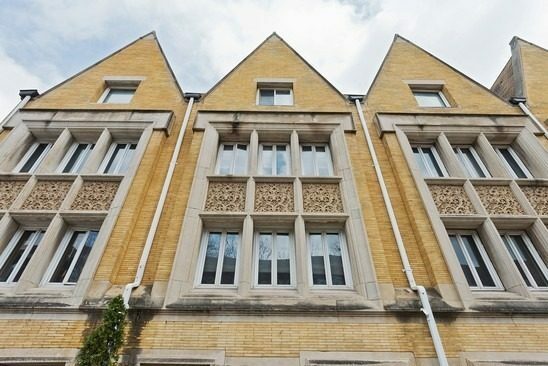 Hitting the National Register of Historic Places in 1977 and attaining Chicago Landmark status in 1979, this row house is not only architecturally significant, but is also relatively affordable at $685,000. Although the current owners are obvious fans of the famed architect, with Wright-inspired hanging art glass panes, lighting fixtures and lamps throughout the home, the house appears to have received major changes throughout the years. Still, the home certainly shows off Wright’s trademark lines and open spaces.